Mantras are words, songs or greetings that we are meant to play in our head constantly with each inhale and each exhale. They are like a meditative tool to assist us in escaping our Ego mind, so we may acquire more peace and clarity. Sat Nam is a mantra used in a type of yogic practice, and it’s meaning is very simple. Sat means truth and Nam means name. 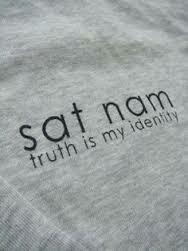 Using Sat Nam as a greeting is a bit like saying ‘I see your true nature’ or ‘I recognize the divine within you’. When repeated with your breath it sends out a vibration that can be very grounding. But I ask, what is the truth of who we are, what does it mean when someone say’s ‘I see the truth within you’, what is it they are talking about? The truth of you, me and every other human living on this earth, is what we all strive for, understanding the true essence of who we are, is the reason we are all here in this life experience. We battle through the hardships, the loss’s, the heartbreaks, the defeats, all the sufferings that life brings with it, what is it all about, what does it all mean? Everything which we experience that seems difficult, is to bring about an emphasis on what we feel on the inside of who we are. Every situation that challenges us emotionally, is meant to bring a focus to the emotional response, ultimately so we can heal it. When we are born we know nothing but love, love is the energy we resinate in when we incarnate, we come with a clean slate, in other words. As time goes on we become conditioned with ancestral beliefs, customs, rules and regulations. Most of this conditioning chips away at the the truth of who we are, over time it begins to mould us into someone that we are not. Somehow the honesty of ourself gets pushed aside with the programming that has been carried down generation after generation. We are no exception, we too take on our ancestors slate, this is what we are taught to believe by our parents, and society as a whole. Eventually when the time is right, and the Universe see’s fit that you are ready, a situation or circumstance will happen suddenly and it will change your life. It will bring about such an internal force within you, that you can not ignore. From that day forward your new mission will be to find your way back to yourself, before the conditioning, before you lost sight of who you are. When things begin to change, it is because you are ready to stand in the pure essence of your Soul. This mission will bring about a new energy within you, one that is powered by courage, trust and faith. A new world will open up as you travel on this profound journey, a journey in search of your truth. Let Sat Nam be your mantra along the way, to assist you and help bring you clarity of mind.